I'm typing this on a laptop with a real keyboard. Real, as in without the compromise in size, tactility or function that you've come to expect in laptops. I don't really know how to express how strange that is. Imagine your laptop was outfitted with the same high-quality typewriter you use at your desktop—an 87-key SteelSeries keyboard with Cherry MX Brown switches. Every keypress is a satisfying delight. That's what I'm doing right now. On a laptop. It's really, really weird. 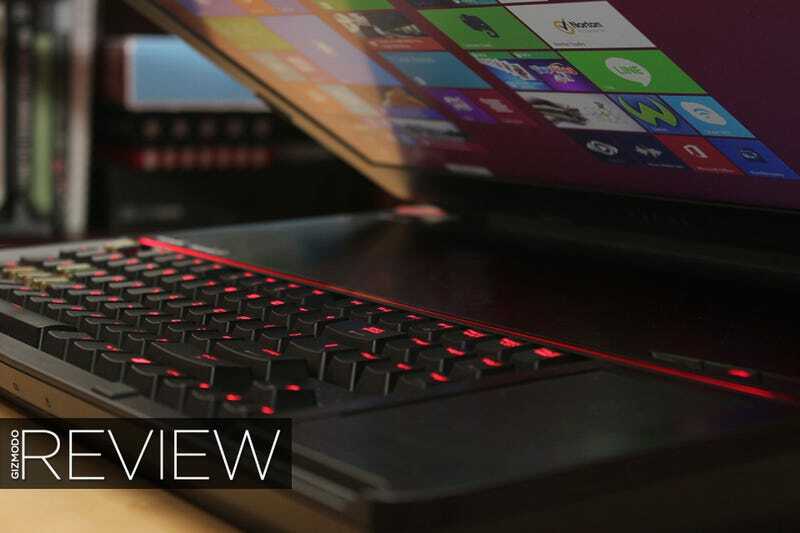 Truth be told, I'm hesitant to call it a laptop—the machine I'm talking about is MSI's GT80 Titan. It's more of a foldable all-in-one desktop PC. Sure, I could (and do) put this thing on my lap, but I don't really want to: it's heavy, absurdly large and that keyboard is positioned so low on the chassis that it's uncomfortable to use in close quarters. But there's another reason it's so big. In addition to being a bitchin' typewriter, the Titan sports dual GeForce GTX 980M graphics chips. This is a monster gaming rig. It's an enormous, 18-inch gaming PC with a mechanical keyboard crammed into its chassis, and it confused the hell out of the regulars at my local coffee shop. "What kind of computer is that?" One man asked, eyes bulging. The Titan took up more than half of the tiny cafe table I was sitting at. Foolishly, I started by giving him the product name. "It's an MSI GT80—" He stopped me short. "You've already lost me," he said. He'd never even heard of the manufacturer, but he was mesmerized by the size of the chassis. When he circled around to my end of the table, he almost lost it. "Wait, what is THAT?" he cried again, pointing not to the keyboard itself, but the seemingly empty space above it. I was having trouble explaining it to him: most laptops hide their internal components under a thin keyboard, but the Titan's big, desktop keyboard is too thick for that, so there has to be some dead space. Suddenly it clicked: "Oh yeah, it is a real keyboard," he noted. "...why would you want that?" Well, because it's more tactile; it feels better, more like your regular desktop computer might. "Ah, I see," he said, extending an index finger. "It's for people with a lot of money." He's not wrong—the GT80 Titan I'm using costs $3,300. At least there's a lot under the hood. Behind the best laptop keyboard I've ever used, the Titan hides 16GB of RAM, a 2.6GHz Intel Core i7-4720HQ processor, a 256GB solid state drive, a 1TB hard drive for extra storage, and the dual GPU setup I mentioned earlier: two NVIDIA GeForce GTX 980M graphics chips in an SLI configuration. If you don't understand what those specifications mean, read it as this: the GT80 Titan is a ridiculously powerful gaming PC—and I mean that word very seriously: ridiculous. It's among an extreme minority of "portable" gaming machines that can shrug at the heaviest-hitting PC games. In practice, there wasn't a single thing I tried to play on the Titan that didn't look gorgeous, but to keep it simple, only three games really count: Crysis 3, The Witcher 2 and Far Cry 4. All of these games are individually known for bringing computers to their knees, but the Titan played all three of them on maximum settings without so much as a stutter. Not even features like The Witcher 2's Ubersampling mode, or high-end anti-aliasing techniques gave the machine pause. It was great. It dang well better have been: it costs $3,300! So, if the keyboard and internal components live up to the exorbitant price tag, certainly everything else does too, right? Eh, not so much. Don't get me wrong—the 1080p screen, the nice, loud Dynaudio speakers and plethora of connectivity options (five USB ports, three monitor outputs and even optical audio) are great, but the shadow of compromise hangs heavily over the computer's trackpad. See, the keyboard is so low on the chassis, it takes up the space where the touch surface normally would be, so MSI decided to move the pad over to the right. This is almost okay—its location feels pretty natural (sorry lefties) and it has a special mode that turns it into a touch-numpad (sorta kinda giving the laptop a full-sized keyboard), but it's also really small. I can't move the mouse across the entire screen without picking up my finger four times without turning it up to a sensitivity level that kills my precision. That's almost as ridiculous as the machine's keyboard is wonderful. Despite the minor flaws and enormous size, I kind of love this PC. It reminds me of the laptop for Warren Ellis's Transmetropolitan: a machine that put the tactility of the keyboard above its form factor. As a writer, that's a really intriguing idea to me. It's nice. I also kind of dig that—even though you never, ever should—you can take this powerful workstation on the go. Sitting at my coffee shop, I enjoyed the same experience I would at my desk—the same enormous screen, the same raw power and the same satisfying "click" with every letter I typed. The Titan isn't meant to venture into the outside world (the battery only lasted two hours under a light workload), but I like that it can. The Titan is a weird, kind of wonderful and prohibitively expensive machine. I love it, but I could never justify actually buying it. It represents a weird middle ground between PC gamers who don't want to build their own desktop, still crave the creature comforts of high-end peripherals and big screens, but for some reason refuse to satisfy that need by simply buying a USB keyboard and a spare monitor. I don't know who the Titan is for. Whoever they are, they're going to enjoy the hell out of it. Provided they buy a USB mouse, of course. Oh, and now that the idea of laptops with real keyboards is out there, would someone mind making me a lightweight, 14-inch typing machine? Preferably modeled after that Transmetropolitan typewriter? Thanks.